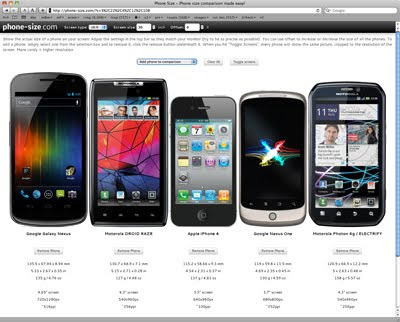 phone-size.com does exactly what it says on the tin. Useful. 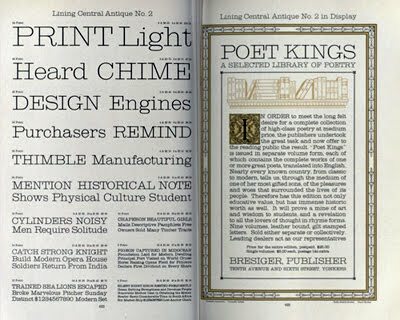 The Internet Archive is hosting a copy of the American Specimen Book of Type Styles released by the American Type Founders Company in 1912. It's a 1300-page book listing hundreds of typefaces and their possible applications. Xobni has released Smartr Contacts for iPhone, an iOS adaptation of its popular contact and relationship management solution for other mobile and web platforms. Smartr Contacts is a free app that allows users to extract information from their e-mail data and social network connections to create integrated profiles for their contacts, combining details from different sources such as phone numbers, photos, e-mail history and social network status updates. Contacts are further ranked within the app by importance rather than alphabetically, placing the most commonly referenced contacts nearer to the top of the list and also provides linked contextual e-mail and calendar information for each contact. Our designers targeted a reduced silhouette. 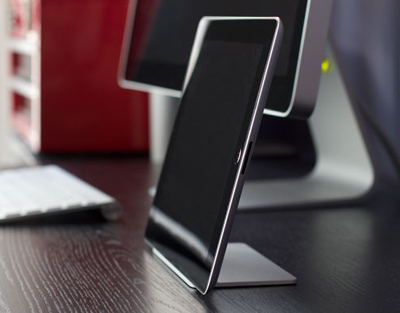 Viewed from the side, you see only the iPad's tilt, and a flat plate on the desk. Magnus may look like it's defying gravity, but it feels like a permanent attachment. You may need two hands to separate it from your iPad. 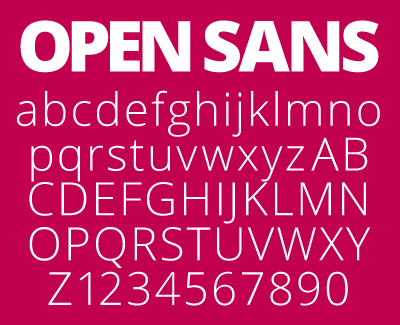 Open Sans is available in 5 weights (with their complementary italics) from Font Squirrel. 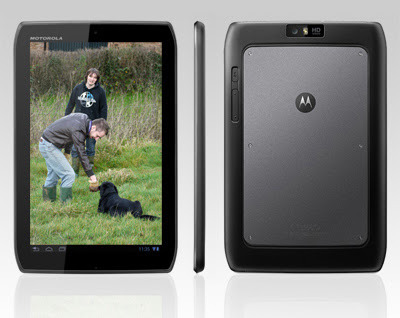 Register Hardware has published a review of Motorola's latest tablet. "Like Goldilocks with porridge, I’ve yet to find a tablet size that I think is just right. Seven inch models are too small, 10.1 inchers too big. The iPad with its 9.7in screen should do the trick but it’s just too square for me – physically and metaphorically." "Motorola may just have cracked the problem with a cut-down version of its Xoom 2 . The key difference is the screen which now measures 8.2in corner to corner but keeps the Xoom 2’s resolution of 800 x 1280." "At 8.9mm thick, 216mm wide and 140mm tall it’s much easier to slip into a backpack or bag, and at 388g it’s the lightest high-end tablet you can buy." 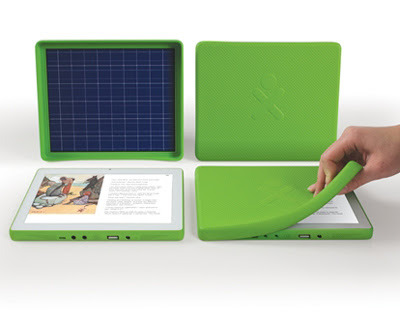 "The new reduced shape, size and weight make the Xoom 2 ME a very fine e-book reader too. Holding it in one hand for prolonged periods is no chore and the rubberised back minimises the chances of it slipping through your fingers to virtually nil." "Some of the weight saving is also due to the reduced sized battery. At 3900mAh it’s only just over half the capacity of the 7000mAh battery in the Xoom 2. Looping a 720p MP4 video, it managed 4 hours 20 minutes from a full charge but in more general use you can easily get over seven hours depending on screen brightness, Wi-Fi use and so forth." "Inside you get a 1.2GHz TI OMAP 4430 dual-core chip, 16GB of storage, 1GB of RAM and 1.3 and 5MP cameras pointing forward and backwards respectively. Usefully the web cam now works with Skype video calls." This is a free font created by emptypage design studio, inspired by the Akzidenz Grotesk typeface. 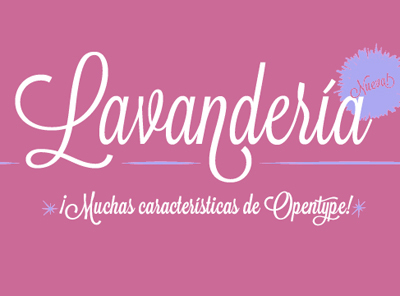 If you use our font in your design, please tell us about this and show your work. Font contains Western and Central Europe encoding, and also Baltic and Turkish. 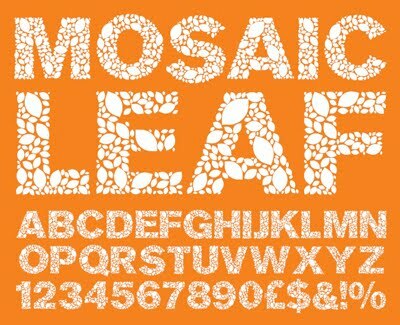 Mosaic Leaf include also Nordic characters set, numbers, punctuations and symbols and currency symbols. The VHS video may now be just a nostalgic memory for most of us. 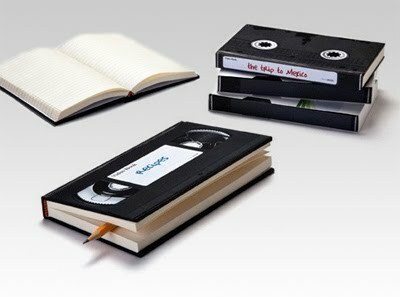 But this retro video notebook revisits the now obsolete format. Celebrating the best parts, the Video Notebook comes complete with a protective video cover and a set of those famous sticky labels. It is ideal for carrying around in your bag, taking on your travels, keeping on your desk or storing on your bookshelf. Ruled - 260 pages. Dimensions: H19 x W11 x D2.5cm. £11.50 + p&p. 3D printing service Sculpteo have announced a free iPhone app that you can use to design 3D objects, upload your designs to the cloud, and receive a ceramic object in the mail a few days later. The designs are based on photographs you take of yourself or a friend. Sculpteo’s app turns your face’s profile into a 3D object, such as the vase shown here. You can also transform it into a number of other objects, such as a bowl, plate, or mug. Once you’ve completed the design, you upload it and Sculpteo sends it to a local 3D printing facility which manufactures the object using a ceramic printing process. Pricing depends on the size and complexity of the object: Large objects such as the vase above cost about $300, while a small cup costs just $70. Making use of its Android platform, SC1630 users will be able to download a wide range of apps and games. The company points towards the SC1630s camera credentials – a 16Mp CCD sensor and 3x optical zoom – as features smartphones fail to match. On the rear there's a 3.2in touchscreen display, with a host of production functions, scene modes and editing tools. There's Bluetooth and WiFi and there will be a 3G option. 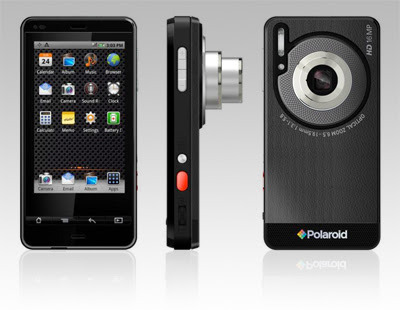 Polaroid has yet to announce pricing or a release date. Digital Photography Review have published a comprehensive review of Canon's flagship 'enthusiast' compact. 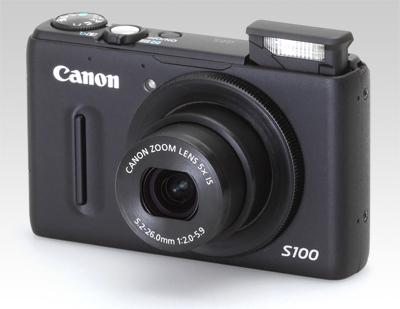 The S100 combines the best qualities of a pocketable point and shoot and an enthusiast compact camera. It provides well thought-out full manual control in a form factor approaching the size of Canon's Elph series. Canon S100 boasts fast continuous shooting speeds and short shot-to-shot times. The S100 is one of the few compact cameras that stays light on its feet even in RAW+JPEG mode (assuming you're not trying to shoot continuous bursts). The S100 produces well-balanced JPEG images that are full of detail and color. In typical Canon style, minimal default chroma noise reduction in the S100 results in JPEG images that retain a good amount of low-contrast detail without appearing desaturated. Overall, the S100 is very competitive: it is capable of delivering very good image quality in an addictively small package, in a wide range of shooting environments. It is also a genuine pleasure to use, thanks to its effective and well thought-out operational ergonomics. The Canon S100 is well-suited to two types of photographers: compact camera shooters looking to upgrade to a similarly small camera with more control, raw mode and better image quality, and DSLR photographers looking for a compact 'take anywhere' pocket camera with much of the same manual control as their larger cameras. One Laptop Per Child (OLPC) has been showing off the first models of its XO 3 tablet at the Consumers Electronics Show in Las Vegas. The 8-inch tablet uses the 1GHz Marvell ARMADA PXA618 processor, 512MB of RAM and comes with a 1024x768-resolution LCD, or a lower cost Pixel Qi sunlight-readable display. Connectivity is via an Avastar Wi-Fi system-on-chip and the tablet can be hand-cranked for power, or there’s an optional solar cell contained in the tablet cover. OLPC said that the tablet could be configured with either a Linux or Android operating system and will be sold exclusively to governments and aid organisations. The lowest cost tablet is expected to be around $100, although that would rise if Microsoft’s lawyers decide to extract an Android patent tax. It is tablets like these that will be dropped by helicopter into remote villages as part of an research project by Professor Sugata Mitra into machine learning, that will test if people can teach themselves to write and use the internet without instruction. The project could revolutionise literacy programs around the world. My Panasonic G1's neck-strap was rarely used as intended. Usually I wrapped it around my wrist, but it was bulky and clumsy, and occasionally obscured the lens. 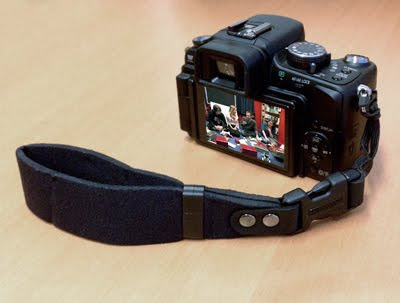 This wrist strap is comfortable to use, and substantial enough to support medium-size cameras. It is also easily detachable. £7.52 inc. p&p from Amazon. MakerBot just took the wraps off the Replicator, a new 3D printer that solves one of the technology's biggest problems at the moment - printing large. It also offers up the company's Dualstrusion technology, making it possible to print in two colours. The Replicator can take either ABS (the plastic found in Lego) or biodegradable PLA plastic. 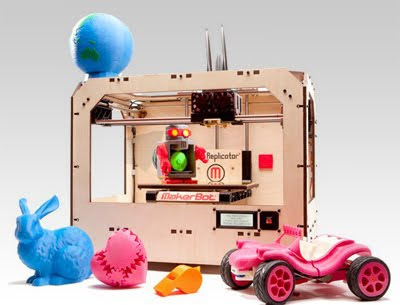 The Replicator will run $1,999 for the dual extruder or $1,749 for a single. Easily add 16GB of extra storage to your PC, netbook, notebook, car audio and more without increasing the size of its footprint. 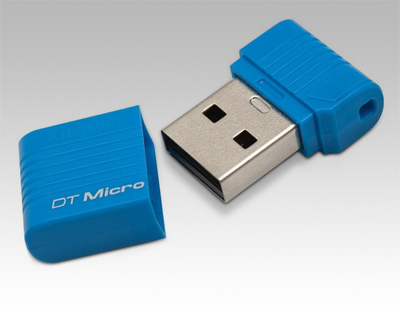 Kingston’s DataTraveler Micro USB Flash drive is designed in an ultra-small form factor that it even can be permanently left in the device while on the move. The DV300F has a 5x, 25-125mm, F2.5-6.3 stabilized zoom lens and a 16MP CCD sensor. 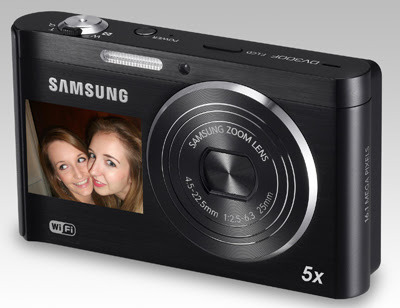 It also features a 1.5" LCD on its front plate to allow easy self-portraits. 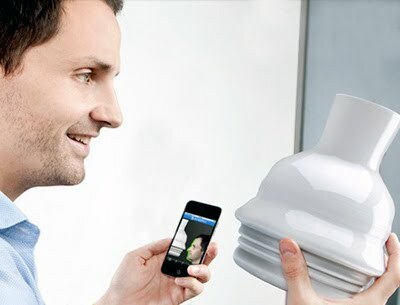 Its stand-out feature is its WiFi capability, that allows it to be remotely controlled from an Android smartphone (an iOS version is being developed). It can also automatically backup your images to your home computer via a WiFi network, or to a 'cloud' service such as Microsoft's SkyDrive or Samsung's All Share Play, avoiding the need to remove the camera's MicroSD card. Zócala has published an excellent article by Ken Murray on how medical professionals approach their own deaths. "Years ago, Charlie, a highly respected orthopedist and a mentor of mine, found a lump in his stomach. He had a surgeon explore the area, and the diagnosis was pancreatic cancer. This surgeon was one of the best in the country. He had even invented a new procedure for this exact cancer that could triple a patient’s five-year-survival odds – from 5 percent to 15 percent – albeit with a poor quality of life. Charlie was uninterested. He went home the next day, closed his practice, and never set foot in a hospital again. He focused on spending time with family and feeling as good as possible. 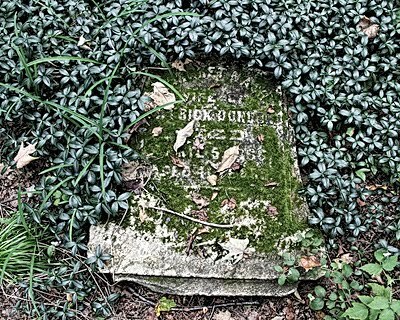 Several months later, he died at home. He got no chemotherapy, radiation, or surgical treatment. Medicare didn’t spend much on him." 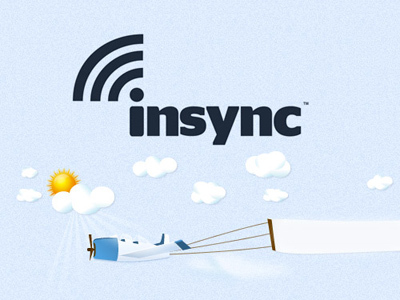 Insync is a new syncing and backup service similar to Dropbox, but with a bunch of additional features, like syncing your Google Docs and Gmail contacts. You can also drop any file into the Insync folder and it'll save it to your cloud storage and sync it with your other machines. 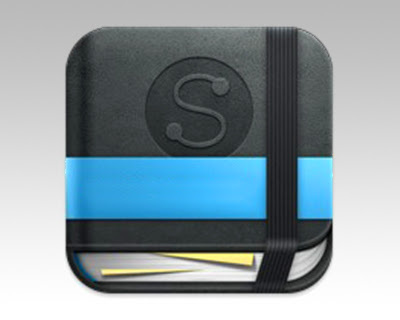 Insync is free for individual users and business accounts (limited to five users). Both account types come with 1GB of free storage. Additional storage options are forthcoming. Brett's 2p'orth: I'm giving it a try, and it works fine, however, there is a (Google-imposed) 10MB limit on individual file sizes. Dropbox remains my 'cloud' storage of choice, but I'm using Insync to free up space on it for larger files. 1. Read through TNIV Bible using Robert Murray M'Cheyne plan. 2. Study Joshua - 2 Samuel using commentaries. 3. Resolve house insurance dispute. 4. Begin refurbishment of house. 5. Choose and purchase replacement for current vehicle. 6. Take regular long walks. 7. Improve guitar skills (at least 30 minutes per week). 8. Read at least one novel.